The CIC developed a plug fabrication capability to understand a key gap in the local composite market. Our prototyping team offers high-quality plug and direct-to-mould fabrication services at our facility in Winnipeg, Manitoba. 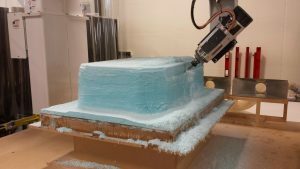 For our clients, the biggest advantage of having prototyping done locally is the ability to visit our facility to be more involved in the process. When we began manufacturing plugs, the most common materials used for fabricating ground transportation patterns were medium-density fibreboard (MDF), polyurethane toolboard and extruded paste. When fabricating with the lowest-cost material, MDF, we found that the material was lacking in through-thickness consistency. This resulted in a significant increase in labour time to finish the plugs to an acceptable surface quality. We also noticed that the quality of MDF was inconsistent between suppliers and batch-to-batch. 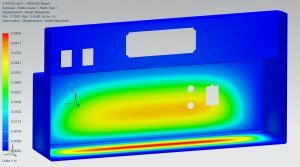 To solve this problem, our team sourced and started using high-density fibreboard (HDF) and discovered that it was a much better material to work with. The durability of the HDF material allowed us to make longer-lasting prototype moulds that could endure a small-quantity production run of service parts. To date, our longest in-service direct-to-mould HDF plug has endured thirty-two part pulls (and counting) without any re-work on the mould surface. Prototype moulds can also be used to create production tooling after the prototype phase is complete. 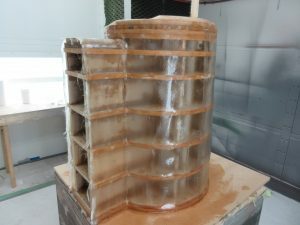 A master can be constructed from the prototype mould and a production tool can be fabricated from the master to facilitate a larger run of parts. 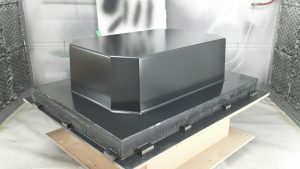 Alternatively, if the prototype parts do not meet a client’s requirements, the prototype mould can be altered or replaced before the client has invested heavily in a production tool. Because our focus is on innovation and economic development, we try to improve our application of process and materials to provide our clients with the best product that we can deliver for their dollars spent. We routinely consult with material suppliers and industry to help determine the course of our capability development. Our ultimate goal is to attract an industry partner willing to take on plug fabrication in Manitoba on a commercial scale. With this in mind, we continue to invest in this capability and welcome industry collaboration to help make this service successful and value-added. Crestline Coach approached the CIC to create a composite solution to replace their existing ambulance cabinet system made of layers of foam laminated between two plastic sheets. Crestline is a manufacturer of high-quality ambulances, and leading supplier of transit, tour, shuttle and wheelchair accessible buses nationwide. Their client was looking for a lightweight and durable system that has anti-microbial properties to use in their ambulances. Our team re-designed their existing system for composite manufacturing and used finite element analysis (FEA) to determine the structural strength of the fibreglass cabinets and aluminum structure. The FEA allowed us to determine the composite layup needed to meet Crestline’s strength and durability requirements of a cabinet rated for 60 lbs. The new system also provided an estimated weight savings of 52% compared to the original. Our team then connected Crestline with Henkel Canada to provide recommendations on using adhesive bonding to replace mechanical fasteners, which consolidated parts for a faster and less labour-intensive assembly. As a result of switching to a fibreglass and aluminum construction, the cabinet system not only is lighter, stronger and faster to manufacture, but it improves infectious control inside the ambulance, providing a safer environment for transporting patients. 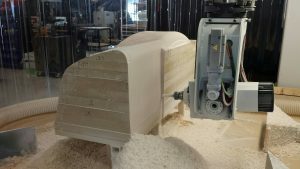 The first set of composite cabinets has been prototyped by the Carlson Group of Companies and 30 units are set to be manufactured in the summer of 2016 and installed in ambulances by the fall of 2016.